Not exactly fun, but a very happy ending. Long distance paddle boarder, Charlie Head, spotted the little Shih Tzu stranded on rocks by the incoming tide. 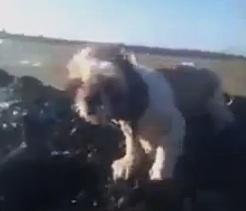 Charlie interrupted his attempt at a 600 mile row from Cornwall to London to rescue the very lucky pup. No one on shore was aware the dog was out there. Many dog owners seem to think their dogs don’t need to be kept safe around water. However, even the strongest swimmer is no match for rip tides and any dog will eventually tire & drown in just calm water. Hypothermia is probably the biggest threat to a dog’s safety in water. A dog’s coat loses its ability to insulate well when wet. The water doesn’t need to be extremely cold for hypothermia to set in. Temperatures that would be fine on land can be deadly in water. A water temperature of 10 °C (50 °F) often leads to death in one hour, and water temperatures hovering at freezing can lead to death in as little as 15 minutes…Water at a temperature of 26 °C (79 °F) will, after prolonged exposure, lead to hypothermia. Get your dog a good life jacket! One that is secure and keeps their head above water—not all of them are good. I’ve posted previously about our favorite life jacket. bless you….bless u ….maybe next time a leach will help or a big net…what a hero..